In Appearance > Menus, click the menu item’s Uber button to open the Menu Item Settings panel and click the Image tab. 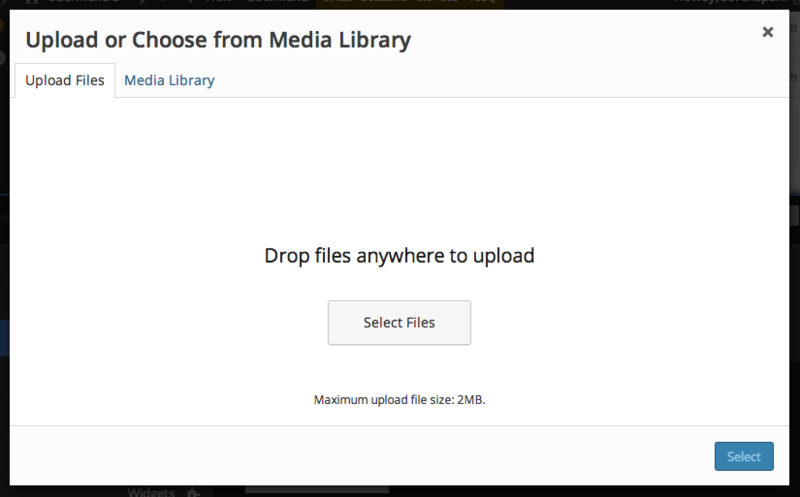 If your file is not already on the server, click the Upload Files tab and upload your file. If your image already exists in the Library, proceed to step 4. Click the image you want to use to select it (this will occur automatically after upload). Then click the blue Select button in the bottom right to apply your selection. Click the Save Menu Item button to make your changes appear on your site. For post (Post, Page, Custom Post Type) menu items, your post may already have a Featured Image. If you’d like to use this image in your menu, you can use the Inherit Featured Image setting. 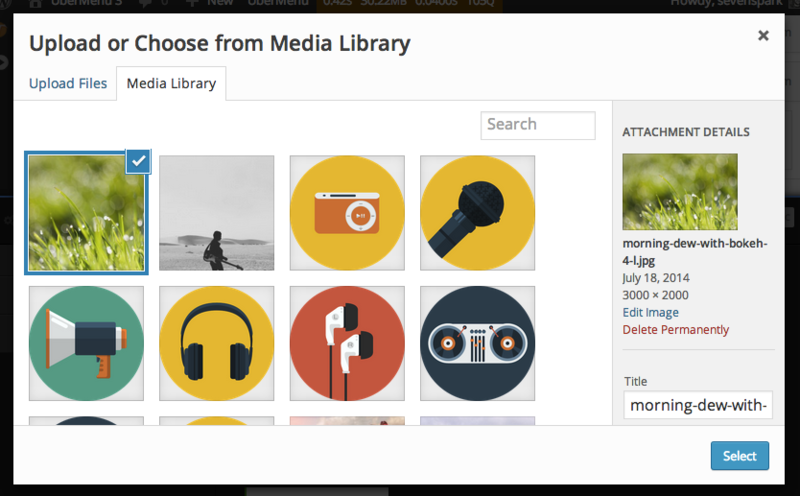 By choosing Assign Image on Save, when you save your menu item, UberMenu will look up the featured image for the associated post/page and assign it as the Image for this menu item. This way the image doesn’t need to be determined every page load. This is more efficient, but if you change your featured image on your post later, you’ll need to also re-save the menu item for it to appear in the menu. By choosing Dynamically Inherit, the menu will look up the featured image and apply it when the menu is generated. This is less efficient, but it will always show the latest featured image from your post. If you use the WP Menu Cache plugin or a general caching plugin, this inefficiency is mitigated. Note that for Dynamic Items, you need to choose Dynamically Inherit, as there is no associated post for the menu item. This setting refers to the dimensions of the actual image file. You’ll want to choose the smallest size that will work in your menu. Any registered image size on your site is available to choose from. 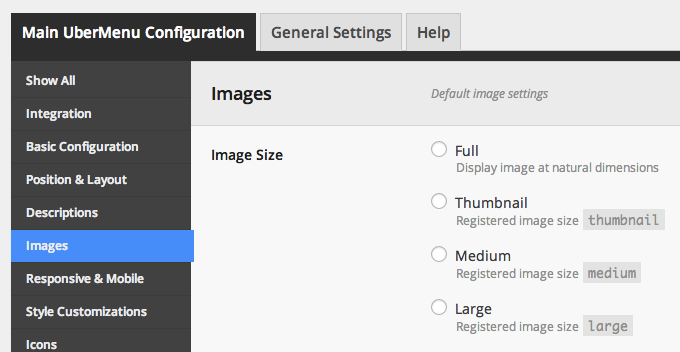 You can set the default image size for all images in your menu under the UberMenu Control Panel > Main UberMenu Configuration > Images > Image Size. Any menu item with the Image Size setting set to Inherit will use this size. Important: if you want the image to appear to the left or right of the menu item, you will need to set the Image Width setting so that the proper sizing is provided. Otherwise, your image may be too large to fit there naturally. You can set the Image Width globally in the Control Panel, or on individual items in the menu item settings.